First Look doesn’t apply here because this software is freeware. The program uses the default Microsoft Installer, if I’m not wrong. So I give it 3 of 5 points. Plain simple, easy to use, ’nuf said, full points (5/5). 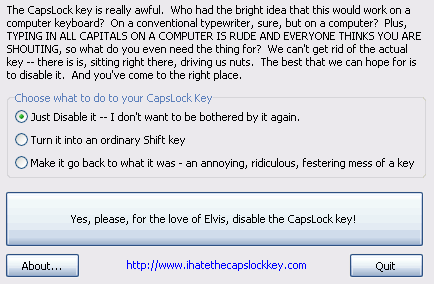 CapsLockBeGone is not a game, so I don’t evaluate this point. After installing in less than a minute I guess I’m allowed to give it full points again. The installer is easy to use and if you are not experienced enough, you can run it with the default configuration. 5 points. It doesn’t require a reboot, so I give this software another 5 points. It is some kind of run-once program. You only use it once to disable the caps lock key and you may use it again to enable the caps lock key again. The look is ok, it fits to the easy to use style. Requirements? The only requirement, as stated on the website, is only Microsoft Windows and it should even run on Windows 95! Performance…I don’t know how to evaluate this because it is a really easy program… Overall I give it 5 points. The program is self-explanatory, so this point also gets 5/5pts. I found no bugs at all, so full points. Overall this tool is very useful. How often did I swear on the caps lock key and now it is gone. No longer using caps by accident, just because of a tiny, easy to install and use program. Thank you Nick Hodges! Without you, I would still struggle with my caps lock key. Again full points. CapsLockBeGone is the first software I’m evaluating using my review scheme. Surprisingly, well, maybe not, anyway, it got full points. I really tried to find any flaws, but no success. Maybe you could be worried about the fact that the program „messes“ with the registry to have the caps lock be gone, then again, it is easier to use this program than messing with the registry on your own. CapsLockBeGone fully deserves the highest rating I can give. What do you think? Is this tool as useful for you as it is for me? Dieser Eintrag wurde veröffentlicht in Review, Software und verschlagwortet mit Review, Software, Technology von Marco. Permanenter Link zum Eintrag. You know, I never really thought about the CAPS lock until now. But come to think of it, I never use it! You’re right. All it does is take up space. Capslock actually does serve some purpose, although these days we tend to use bolding a lot CAPSLOCK WAS INITIALLY USED TO EMPHASIZE A SENTENCE, PIECE OF TEXT OR PARAGRAPH. The fact that online it got linked to shouting is because many people in games at first began using the emphasizing ability of capslock to make their flaming or commands to others stand out above the normal talk, something which got adapted in chat rooms as well seeing as to how it’s a „fast-paced“ chat medium. As it hit forums and such it became more and more referred to as shouting, but when you actually look at old documents or still these days terms of services and such the usage of capslock is clearly noticeable and probably will remain for quite some time. So no, I’m not all against it, although I must say having it placed left of the A key isn’t too great. Same goes for the windows key next to control for that matter, both in gaming and in chatting these keys are just terribly placed and it would be much better if instead they’d be found near the arrow keys or something. It’s not like anybody still uses those these days :P.
I don’t think you can really count the keyboards without a windows key anymore, hehe. Before software applications were released to block it and games simply went blocking the input as well there have been a lot of people which just wrecked the windows key out or glued it stuck XD. It was always so fun to see on lan parties how many people wrecked those keys out, haha.